Floor covering is a term used to describe any layer of finish material applied over a floor structure to provide permanent covering. Common flooring materials are vinyl sheet & tiles, carpets & rugs, laminates, natural stone, wood, ceramic tiles, and rubber. Resilient, non-resilient, and soft cover types of flooring materials are used based on the type of the application. Carpets are designed for warm or dry applications. They are available in natural and synthetic forms with various patterns, colors, and styles. Hardwood and engineered wood flooring products are highly popular and available in many forms. Engineered wood differs from hardwood; it is a laminate of several wood layers, which is machined to have a specific look and feel. Stone is a kind of flooring option, wherein different types of natural rocks are carved out of a quarry and then cut for applications in flooring. Vinyl flooring is a fully synthetic polymer flooring with added color. Economic gains in developing regions such as Asia Pacific, Latin America, and the Middle East have driven the need for urbanization. Increase in population and growth in urbanization are expected to boost the demand for housing. This is anticipated to pave the way for extensive commercial construction activities such as hotels, offices, and shopping plazas. This is one of the key drivers of the flooring industry. For example, in 2016, the developing economy of North America accounted for large share of urbanization (80%) across the world. The building remodeling industry is one of the major end-users of flooring products. Increase in remodeling activities in mature economies in North America and Europe is driving the demand for flooring. The commercial renovation market has grown steadily and is anticipated to expand during the next few years as more buildings age and require renovation, maintenance, repair, and remodeling. For instance, in 2016, remodeling activities increased at a CAGR of 4.5% in the U.S. This rate is further expected to increase in the near future owing to the changes in consumer lifestyle. In terms of value, the global flooring market is anticipated to expand at a CAGR of more than 6.5% from 2018 to 2026 and reach around US$ 450 Bn by 2026. Demand for luxury vinyl tiles has been rising at a faster rate vis-à-vis that for hardwood or engineered wood products owing to its added value attributes such as scratch and slip resistance, waterproof, and eco-friendliness. Similarly, increase in demand for soft covering flooring products such as carpet tiles, area rugs, and broadloom in North America is projected to augment the market for flooring during the forecast period. Carpet tiles and rugs provide a protective layer to floors. Therefore, such products are highly preferred in regions with cold climate. Increase in construction activities in developed and emerging regions is anticipated to boost the flooring market during the forecast period. In terms of value the global building & construction industry is estimated to expand at a CAGR of 3.4% during the forecast period to reach around US$ 11.0 Trn by 2024. In terms of region, Asia Pacific dominated the flooring market in 2017. Asia Pacific and Europe cumulatively accounted for more than 65% share of the global flooring market in 2017. North America is a mature market for the flooring industry. The real estate industry in above mentioned regions is expanding rapidly due to the shift in government focus toward infrastructure development. Implementation of beneficial regulations along with rising population is making the flooring market in Asia Pacific region highly attractive. 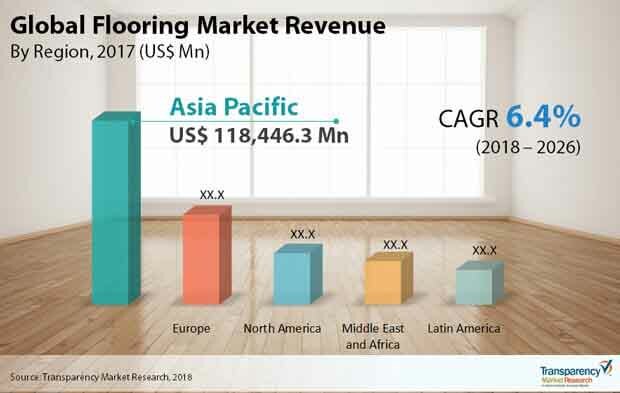 The flooring market in North America, Europe, and Asia Pacific is expected to expand at a fast pace, while that in Latin America and Middle East & Africa is projected to expand at a moderate pace during the forecast period. Key players operating in the global flooring market are Mohawk Industries, Inc, Shaw Industries Group, Inc, Boral Limited, and Tarkett Group. Other players include The Dixie Group, Toli Corporation, FORBO, Congoleum Corporation, and Interface, Inc.
Key players are expected to invest significantly in research and development of innovative products to carve a niche for themselves and gain higher share than their competitors. Adoption of online and offline marketing strategies as means of raising awareness regarding their quality products is also expected to help them strengthen their footprint in the market. For example, in 2016, Gerflor’s technical R&D team innovated a technology called ‘In-registered embossing.’ This technology is complex to master. It uses a press embossing technique, which is more precise than the cylinder systems currently employed in the market in France. It is a painstaking process, reserved solely for the most suitable designs. Flooring is the usual term for a permanent covering of a floor, or it can be defined as the work of installing such a floor covering. Floor covering is generally described as any finish material applied over a floor that provides a walking surface with aesthetics. Flooring and floor covering are used interchangeably. However, floor covering is mostly used for loose-laid materials. Common floor covering materials include vinyl sheet & tiles, carpets & rugs, laminates, natural stone, wood, ceramic tiles, and rubber. Resilient, non-resilient, and soft cover types of flooring materials are used based on type of application. Various types of tile flooring such as ceramic, porcelain, quarry, and mosaic are available in the market. Two major types of vinyl flooring, sheet flooring and tile, are employed in commercial and residential buildings. Vinyl composition tile (VCT) is the industry standard for most commercial applications, as it is durable, resilient, and available at a relatively low cost. Increase in demand for soft covering flooring products such as carpet tiles, area rugs, and broadloom in North America is projected to augment the flooring market during the forecast period. Demand for residential flooring is increasing, especially in emerging countries such as India, Costa Rica, Brazil, Malaysia, and Indonesia, owing to expansion in the construction industry in these regions. These are the major factors driving the market. However, use of toxic chemicals for manufacturing of carpets in the textile industry and presence of volatile materials in vinyl products may lead to several health issues. This is one of the key factors expected to hamper the flooring market during the forecast period. In terms of product, the non-resilient segment held 64.0% share of the global flooring market in 2017. The resilient segment is expected to expand at a rapid CAGR during forecast period. This can be ascribed to the constant growth of LVT and its sub-category WPC/rigid core. In terms of material, ceramic tiles is projected to be a highly attractive segment of the global flooring market during the forecast period. In terms of application, the residential segment accounts for a major share of the global market. The continuing recovery in the construction industry in many countries after several years of recession is expected to boost demand for flooring products. Asia Pacific held a significant share of the market in 2016 in terms of value and volume. The region is expected to continue its dominance throughout the forecast period. The market in Europe and North America is likely to expand at a significant pace in the near future. This report analyzes and forecasts the market for flooring at the global and regional level. The market has been forecast based on revenue (US$ Mn) and volume (million square meters) from 2017 to 2026, considering 2017 as the base year. The study includes drivers and restraints of the global flooring market. It also covers impact of these drivers and restraints on demand for flooring during the forecast period and includes current flooring market indicators. The report also highlights opportunities in the flooring market at the global and regional level. The report includes detailed value chain analysis, which provides a comprehensive view of the global flooring market. Porter’s Five Forces model for the flooring market has also been included to help understand the competitive landscape. The study encompasses market attractiveness analysis, wherein product, material, and application are benchmarked based on their market size, growth rate, and general attractiveness. The study provides a decisive view of the global flooring market by segmenting it in terms of product, material, and application. In terms of product, the flooring market can be classified into resilient, non-resilient, and soft cover. In terms of material, the flooring market can be segmented into ceramic tiles, carpers & rugs, vinyl sheet & tile, wood, laminate, ceramic tiles, stone, and others. In terms of application, the flooring market can be categorized into residential, non-residential, and others. These segments have been analyzed based on present and future trends. Regional segmentation includes current and forecast demand for flooring in North America, Europe, Asia Pacific, Latin America, and Middle East & Africa. The report provides the actual market size of the flooring market for 2017 and estimated market size for 2018 with forecast for the next eight years. The global flooring market has been provided in terms of revenue in US$ Mn and in terms of volume in million square meters. Market size has been provided in terms of global, regional, and country level market. The report comprises profiles of major companies operating in the global flooring market. Key players operating in the flooring market include Mohawk Industries Inc., Shaw Industries Group Inc., Tarkett Group, Boral Limited, and Armstrong World Industries, Inc. The other players include The Dixie Group, Toli Corporation, FORBO, Interface, Inc., Congoleum Carporation, Avant Flooring, James Hallstead Plc, Mannington Mills, Inc., J&J Flooring Group LLC and Gerflor.